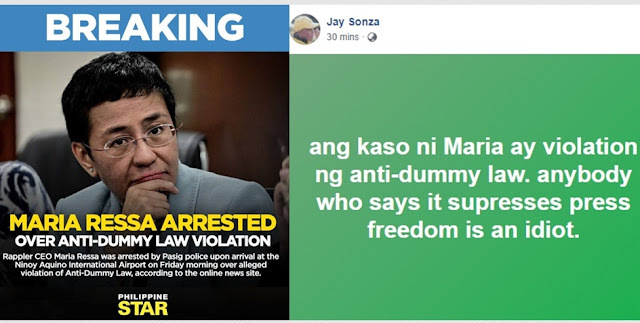 Veteran journalist and prominent social media personality Jay Sonza burned down all the supporters of Maria Ressa and some Yellow Media for claiming that the arrest of the Rappler CEO is a form of Suppression of Freedom. According to Jay Sonza anybody who says it suppresses press freedom is an idiot because the case of Maria Ressa is her alleged violation of the Anti-Dummy Law. Netizens also echoed the statement of Jay Sonza as they lambasted all the netizens who defended Maria Ressa on social media reminding them to really understand the case being filed against the controversial journalist. According to netizen Janz Rodriguez, it is not only Maria Ressa whom the government should investigate, but the government should also file some cases against Manny V. Pangilinan (MVP) of PLDT because they are allegedly dummy of an Indonesian tycoon. Netizen Hye Jin also noted that one of the leading news outlet ABS-CBN are allegedly spreading fake news and wanted to change the mindset of the people by reporting about the possible suppression of press freedom. Erin Cartalla: Hindi ba hindi rin naman Pinay talaga si Ressa?